A medium-sized potato baked with its skin intact is a versatile, low-fat source of dietary fiber and essential nutrients like potassium, copper, iron, manganese, vitamin B-6, vitamin C and niacin. 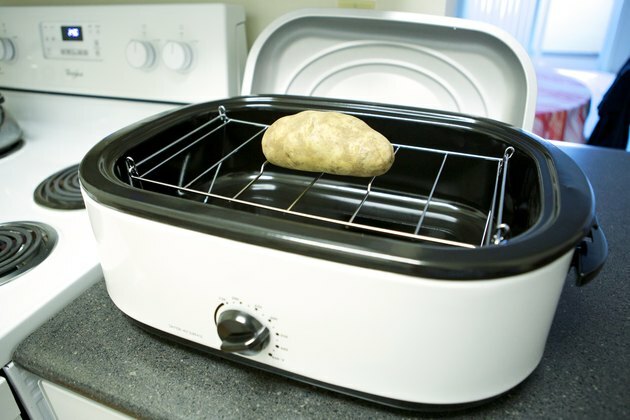 If you're traveling or have limited kitchen space, you can prepare baked potatoes without the use of a conventional oven by using a roaster oven. Roaster ovens are available in a number of sizes, ranging from 5-quart to 18-quart options. 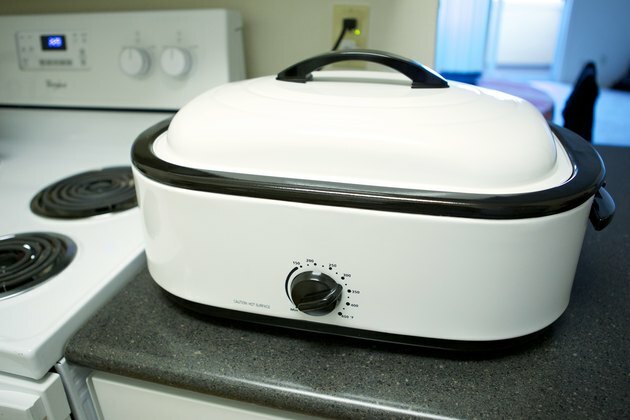 The exact procedure and cooking times may vary depending on your brand of roaster oven: Check the manufacturer's instructions before using the appliance to bake potatoes. Scrub the potatoes thoroughly with a vegetable brush under cool, running water. Dry them with paper towels. Use a fork or thin-bladed knife to pierce each potato several times. Preheat the roaster oven to the temperature recommended in the manufacturer instructions and for the length of time advised. Place a rack in the oven's cooking well if it is included with your particular brand. Place the potatoes into the roaster oven, either on the rack or on the bottom of the cooking well. Fit the lid securely in place. 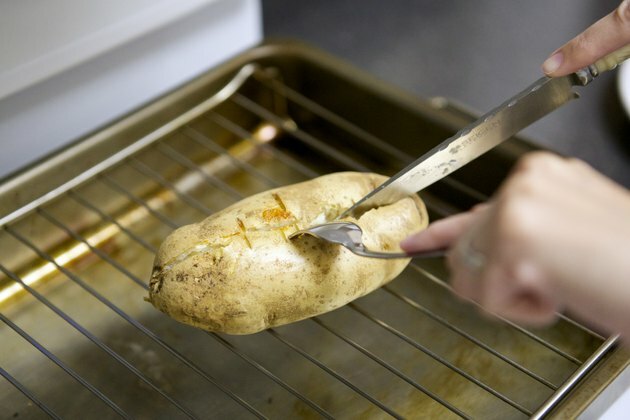 Allow the potatoes to bake until they can be easily pierced with a fork, approximately 60 to 70 minutes. Remove the potatoes with tongs and serve. If desired, you can lightly brush the potatoes with olive oil and sprinkle them with salt before baking them in the roaster oven. You do not need to wrap the individual potatoes in aluminum foil unless you want very soft skin or need to keep the potatoes hot for a long time after cooking. 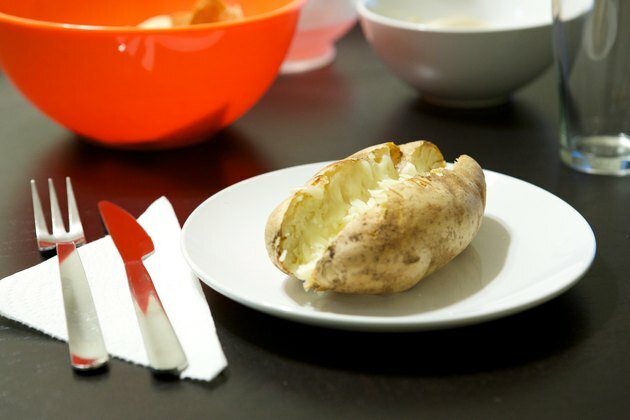 Skip white potatoes in favor of sweet potatoes for a baked potato that's high in vitamin A. Avoid topping your baked potatoes with high-fat, high-cholesterol sour cream or cheese sauce. Instead, try healthier options such as salsa, steamed vegetables drizzled with flavored olive oil or low- or nonfat Greek yogurt mixed with freshly minced herbs like chives. The Kitchn: Old Habits - Baked Potatoes Wrapped in Foil or Not?